With Ramona wineries shuttered except for weekends, our day for a wine and food romp last Thursday was a washout for any place new. 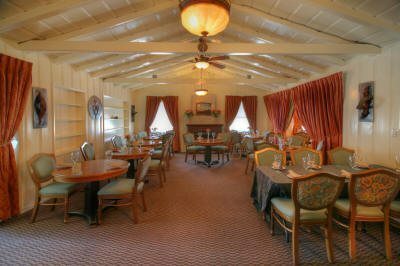 The regulars, Pamo Valley tasting room and Southern California Wine Co., were both too near in the calendar’s rearview mirror. So, it was a reprise in Wynola, just around the corner down SR-78 from Julian, for a wine and restaurant romp, friends Owl and Buzzard in tow. 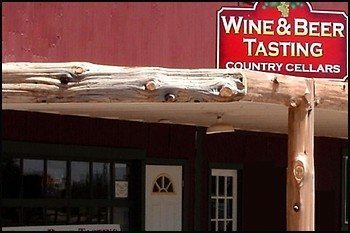 First stop, since it was nearly closing time, was the sly and winsome doña of Country Cellars (4456 Highway 78-just steps away from the Wynola Farms Marketplace) for a take home of a Shadow Mountain “100% estate” 2009 Carignane (sic) at a quite reasonable retail price. Always like to see SoCal locals daring to bottle single varietal from the thunderously leaden pole of the grape spectrum. Jeremy’s On The Hill restaurant (4354 Highway 78 , Wynola) is an inescapable must to or from Julian, so dinner of bison meatloaf, pork tenderloin (top choice here even if you have to split it three ways to warrant the calorie onslaught) and pecan crusted lamb chop (small, not tiny, so reasonable caloric intake, but insist medium instead of house suggested medium rare). Paired was excellent Black Rock 2008 Petite Sirah, only such bottle on their shelf, and list staple 2007 CabFranc (Shadow Mountain ?) at least its equal. Jenkins apple wine for slaking road dust is nice but sparsely flavored so a kiss of something beyond it is a better ticket, even if only from the flask in your pocket. Still waiting for J to serve the Papyrus by the glass before I blindly spring for pricey half bottle. The Julian grape stomp is now in planning stages for anyone stalwart enough to join the caravan. Morloc is a wine and fancy liquor connoisseur who also works San Diego’s shipyards.